4th of Juleezy, 4th of Juleezy, how oh how can I make you more cheesy? Why, by making up the word "Juleezy" in order to rhyme with "Cheesy" for one. 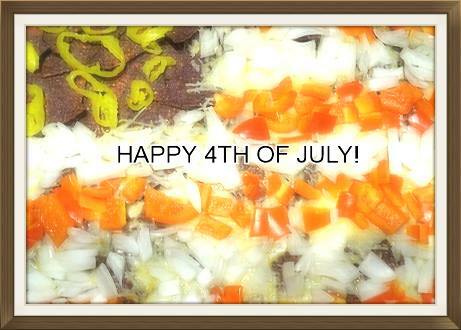 Another way would be to make up some PATRIOTIC NACHOS: A.K.A. PATRIOTIC BBQ GRILLING NACHOS USA USA, the recipe for which is available at the link previous, or featured along with 13 other delicious recipes in Recipes from the Nachonomicon. At this point if you're reading this and in desperate need for nacho goodness for your BBQ this afternoon you're going to have to go with the linked version because there's no way you can order the book and have it arrive to you on time, but if you found it so delicious in retrospect you felt like buying the book, you'd get no complaints from me! And remember, don't go blowing your hand off with some fireworks, because it's a lot harder to eat nachos with a hook.